1. A reusable checklist, created with a business card holder, works well for those who do chores daily. 2. For those who do chores on a nonregular schedule (say, because of shift work, childcare, or *ahem* laziness), I recommend a graph chart in your project section of your planner. 3. Recurring chores only belong on your weekly task list if: 1) they only happen occasionally (like taking out the trash on Tuesdays), 2) there is a special reason they must be done by a certain date (like a house guest visiting), or they are unusual and inappropriate for the checklist (like storing Halloween decorations). 5. The reason I don't put chores on the regular task list is because, if I did, there wouldn't be room for anything else. I absolutely love the grid tracking idea! A great way to see visually how much (or in my case how little!) housework has been done. I may jusy tweak the idea by placing the tracker in the middle of my weekly pages so that I can actually see it. 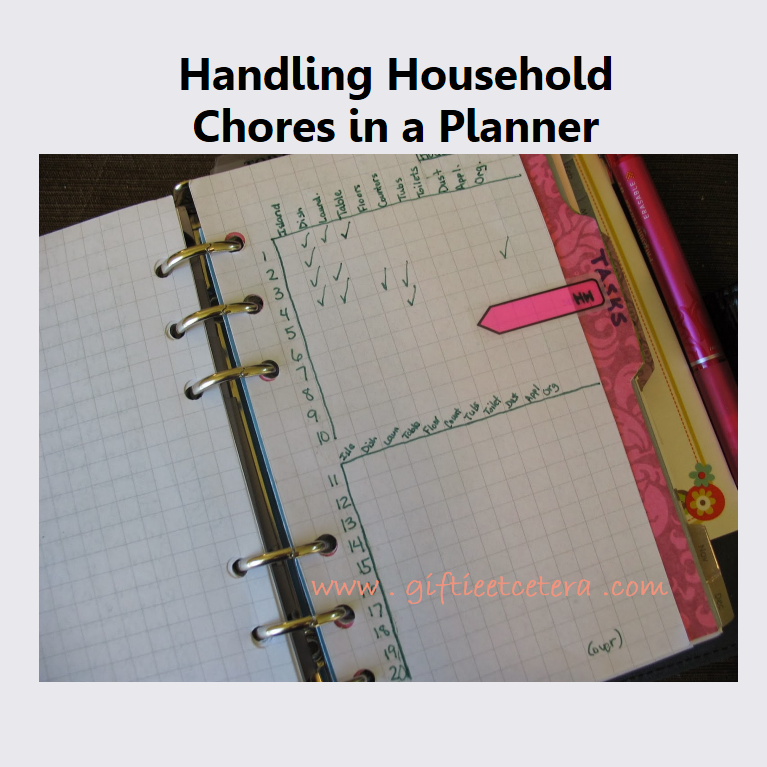 I go through stages of writing down recurring household chores & it does help me when I do. I love the Household Grid idea and will give it a try. I do think this will work for me since I don't do housework on a daily basis. Thanks for the great idea. Giftie what does AAPL stand for? or the next to last task on the top of the paper.